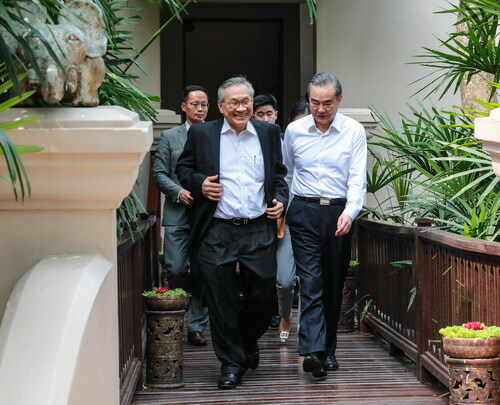 On February 16, 2019, at the invitation of Foreign Minister Don Pramudwinai of Thailand, State Councilor and Foreign Minister Wang Yi travelled to Chiang Mai for the strategic consultation with Don Pramudwinai. Wang Yi expressed that China and Thailand are as close as one family, and both countries are comprehensive strategic partners. Thailand is the rotating presidency of the Association of Southeast Asian Nations (ASEAN) this year. Both countries should intensify strategic communication, strengthen strategic cooperation, and join hands in making positive contributions to regional peace, stability and development. The Chinese side supports the construction of the ASEAN community and will fully support Thailand in fulfilling its duties as the rotating presidency of the ASEAN. The Chinese side is willing to work with the Thai side to push forward the integration between the Belt and Road Initiative and ASEAN's overall plan on connectivity, promote regional connectivity and sustainable development, successfully hold the China-ASEAN Year of Media Exchanges, lift the level of defense and security cooperation and promote China-ASEAN relations and the cooperation in East Asia for greater development. Wang Yi noted that in recent years, under high-level strategic guidance of both countries, China remains to be the largest trade partner, the largest tourist source country and the largest source of international students of Thailand for many consecutive years. Last year, bilateral personnel exchanges exceeded 10 million person-times. The public opinion foundation of friendship between the two countries has been further consolidated and the two sides have also enjoyed sound coordination and cooperation in international and regional affairs. We are satisfied with the status quo of bilateral relations and stand ready to well plan bilateral high-level exchanges and cooperation in key areas with the Thai side, so as to bring China-Thailand relations to a new stage. The Chinese side welcomes Prime Minister Prayut Chan-o-cha to attend the second Belt and Road Forum for International Cooperation in China, and hopes to take this as an opportunity for strengthening bilateral mutually beneficial and friendly cooperation. The two sides should speed up the China-Thailand railway project, build a model for trilateral cooperation and foster highlights in innovation cooperation. 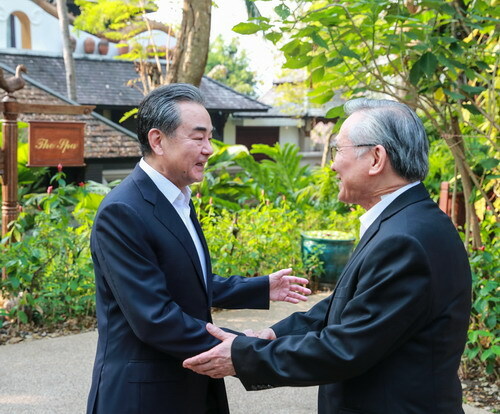 Don Pramudwinai welcomed Wang Yi to hold strategic consultation upon invitation in Thailand at the beginning of the new year, and expressed that Thailand and China enjoy high-level mutual trust and profound friendship, with frequent high-level exchanges and fruitful achievements in economic and trade cooperation. The number of Chinese tourists to Thailand is constantly increasing, and trilateral cooperation among Thailand, China and Japan enjoys smooth progress. Prime Minister Prayut Chan-o-cha looks forward to attending the second Belt and Road Forum for International Cooperation in China. The Thai side welcomes China's development and revitalization, hoping China will play a more important role in maintaining world peace and development. Cooperation under the Belt and Road Initiative proposed by China will bring more opportunities for the development of Thailand as well as Thailand-China cooperation. The Thai side thanks the Chinese side for consistently supporting the construction of the ASEAN community and supporting the ASEAN in enhancing unity and cooperation. The Thai side expects to further strengthen mutually beneficial and win-win cooperation in such aspects as regional connectivity and Lancang-Mekong cooperation. Both sides also carried out in-depth communication on international and regional issues of common concern, reaching extensive consensus.